ICE arrests 77 in Michigan during four-day immigration sweep! 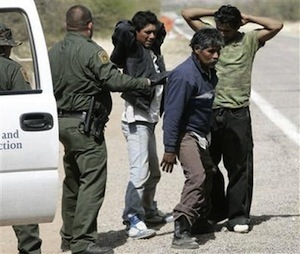 Immigration officials in Michigan arrested 77 foreign-born criminals and immigration violators during a four-day sweep. Of those arrested 75 were Latinos from Mexico, Guatemala, or Honduras. Most of those arrested were non-criminals who had civil violations, mostly for failing to obey a final order of deportation. Over 20 others had prior criminal convictions, and six had returned to the United States illegally after having been deported. Some of those arrested just happened to be with those taken into custody and could not produce immigration documents. The criminal immigrant aliens arrested are subject to immediate deportation as are those with outstanding orders of deportation and those who had been previously deported. South Dakota’s State Legislature has introduced three bills to address undocumented immigrants following the examples set by other states around the country. One bill is particularly similar to one proposed in Arizona that would direct law officers enforcing other laws to make reasonable attempts to determine whether or not the suspect is in the U.S. without documents. The same law also makes it illegal to transport or conceal an undocumented immigrant. Similarly, another bill would penalize any person or business that knowingly employs, transport or conceals an illegal immigrant. The third measure is intended to encourage Congress to propose a change in the 14th Amendment by challenging the automatic U.S. citizenship granted to children of undocumented immigrants. A bill requiring public schools to report the tally of illegal immigrant students to the state secretary of education is one of many state-level efforts in Virginia to curb illegal immigration in the state, and reduce the drain on American taxpayers and the state budget. Todd Gilbert, a member of the Virginia House of Delegates who proposed the bill, says illegal immigrant students will retain the right to receive a public school education, but that Virginia taxpayers have a right to know how much the country’s “broken immigration system” is costing them. 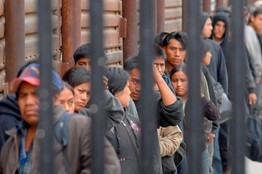 HELP THE STATES’ FIGHT AGAINST ILLEGAL IMMIGRATION – CLICK HERE!